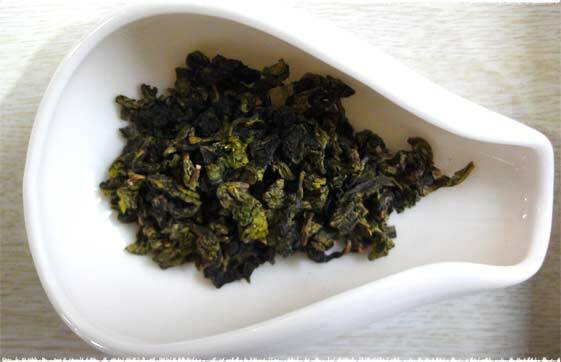 Tie Guan Yin, the half-fermented Oolong family tea is one of most popular premium class Chinese tea. The best quality Tie Guan Yin tea leaf seems fresh and stiff like some dragonfly with its forest green color and smells awesome like some orchid. 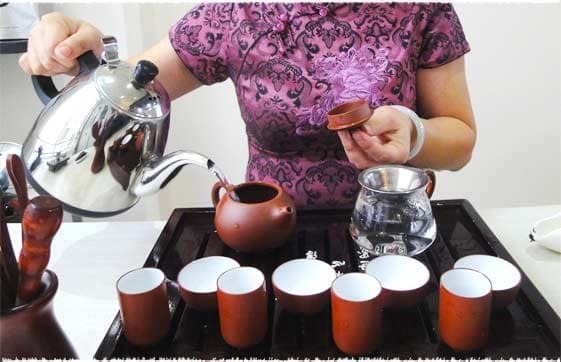 When it is brewed, it gets golden color with the taste which is unforgettably sweet which last in the taster’s mouth till long which is called in traditional Chinese “Yin Yun”. The best quality Tie Guan Yin tea can easily be distinguished with its rich taste, color and of course for its long lasting sweetness. Tie Guan Yin’s smell is the most charming of all other Oolong tea and the taste as well which the real delight of this tea is. Medically, it helps in digesting and dramatically reduces fat. 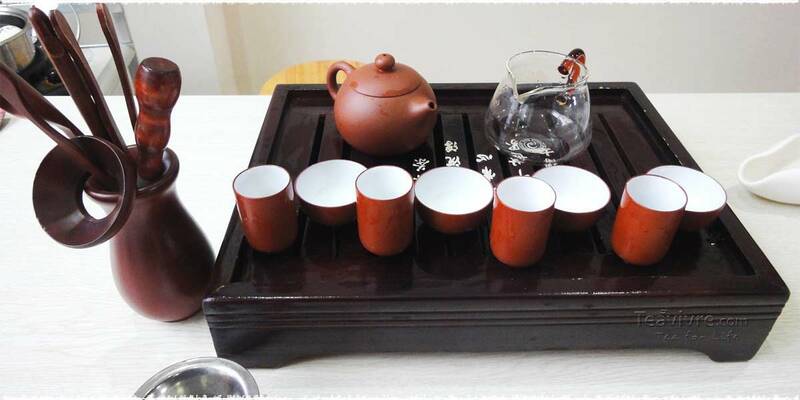 To enjoy the perfect Chinese taste in Western style, everything you use to brew Tie Guan Yin, must be perfect as well. 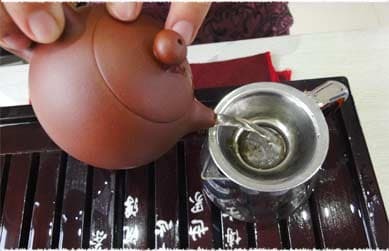 Get the teapot which can hold the extra leaves as to get the rich taste, a little extra leaves are required. 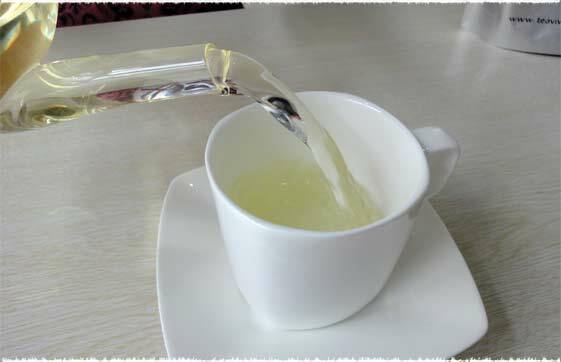 Normally 2 to 3 tea spoons are enough for half liter water but you can change as per your taste. 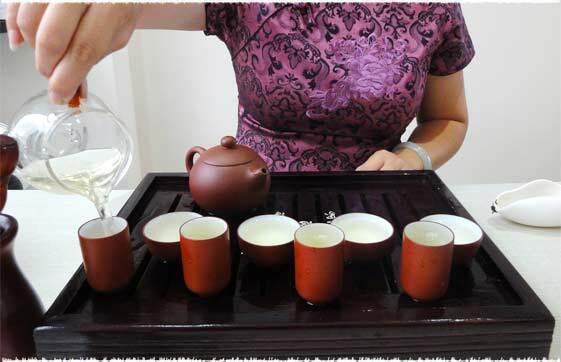 Now pour the water of 100 ºC and wait for 3 to 5 minutes and then the richest taste of Tie Guan Yin is ready to be served. Now serve it in the cups. To enhance the taste and flavor you may add the honey or sugar as well. Enjoy the rich taste of Tie Guan Yin with sweetest smell in the autumn and be fresh. 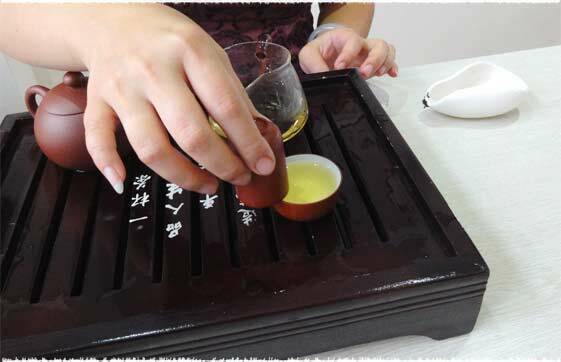 The traditional brewing way of Tie Guan Yin Tea is called “Gongfu”. 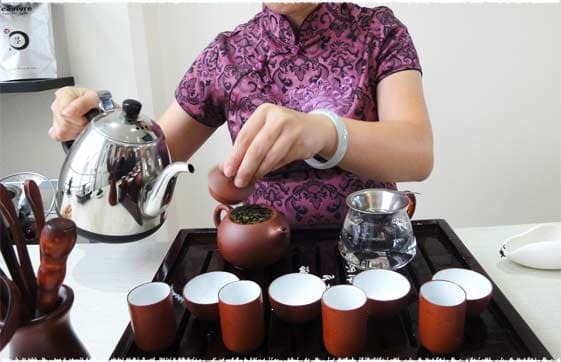 Classic Chinese way of brewing Tie Guan Yin tea requires lots of preparation prior, while and after brewing the tea. First of all you need the complete traditional Chinese Tea set which includes Sand-Fired pot, a tray, tea holder, Pinming cup, fragrance smelling cup, filter, shelf, spoons, funnel and the tea container. 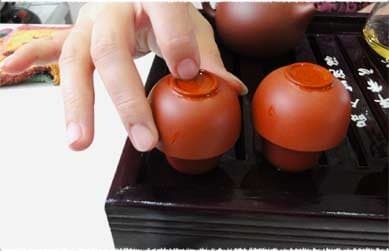 The most important is Sand-Fired pot which gives the whole process the traditional Chinese look. 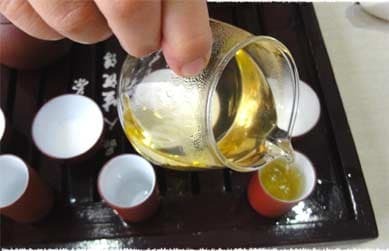 First of all get 5-7 grams of Tie Guan Yin tea from the tea container and put it into tea holder. Now pour the hot boiling water into the sand-fired pot just for cleansing and warming the pot and now use this water of sand-fired pot to clean and warm fair cup and Pinming Cup. 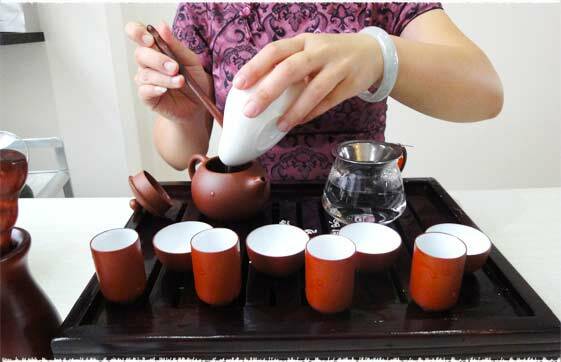 It frees your pots and cups from the other smells and tastes so you may enjoy the real taste with real and optimum sweet smell of Tie Guan Yin tea. Now put the tea into the Sand-Fired pot with the teaspoon and then add the 100 ºC hot boiled water. There will be some white foam on the surface which is removed with the lid. And then lid is cleaned as well. This small process is sometimes named as “face wash” and some times it is said, “Spring breeze is blowing”. The liquor is not for drinking as it will just recover the tea. Use this liquor to warm the cups by pouring the liquor into the cups equally. Again pour the boiling hot water into the sand-fired pot from some height so the water may get mixed well with the leaves. Then put the lid back and wait 20 to 30 seconds. After that remove the lid and smell the lid from the distance for 2 inches with a deep breath. Judge the smell if the tea is ready for you. Now pour the liquor into the fragrance smelling cups equally. Put the Pinming cups upon these fragrance smelling cups. And then the last step is to put heaven and earth upside down. Turn the fragrance smelling cups and Pinming cup upside down and let the liquor to pour into the pinming cup without removing the fragrance smelling cup from up. Now finally remove the fragrance smelling cup and smell it with your deep breath and be lost in the sweetest smell of Tie Guan Yin tea. Now taste the liquor with a sip and your eyes will be closed with its richest taste that you would have never tasted before. It’s the famous classic Chinese tea in its traditional Chinese style. You can use the same leaves to brew it 6 times more as Tie Guan Yin is the tea which remains same fragrant even after brewing seven times. 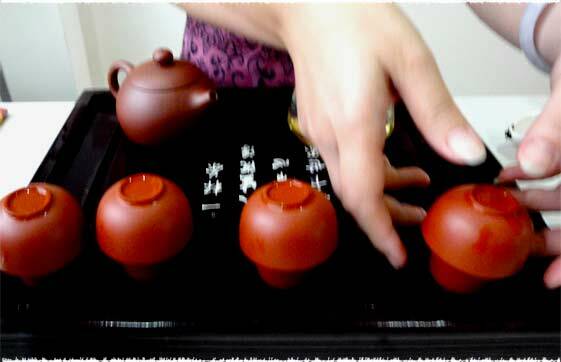 But for that you must choose the best quality Oolong Tea – Tie Guan Yin tea. I have a 120ml yixing pot. How much leaf do you recommend? Hi Stéphane, thanks for your question. 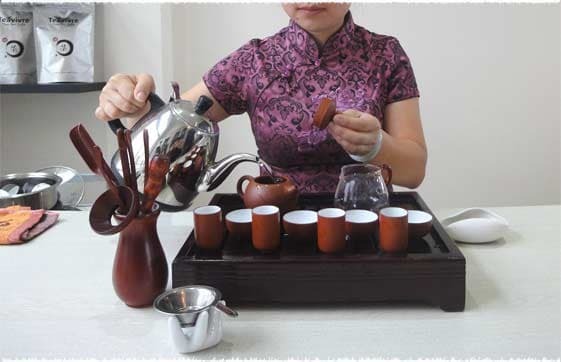 Usually, we recommend 7g tea leaves for 110ml Gaiwan. 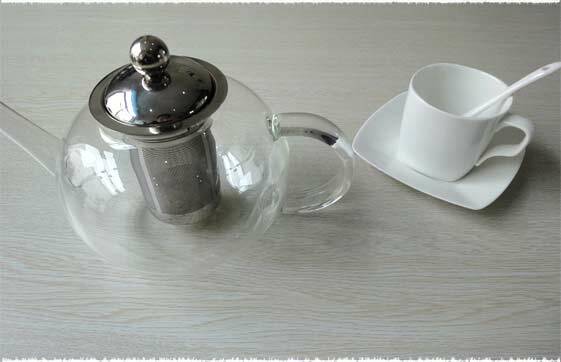 And same as the teapot, 120ml teapot also can use 7g tea leaves, but you can add the appropriate brewing time according to your own taste. Hope it helps, and if you have any further questions, please feel free to contact us! It depends on you how to brewing the tea. 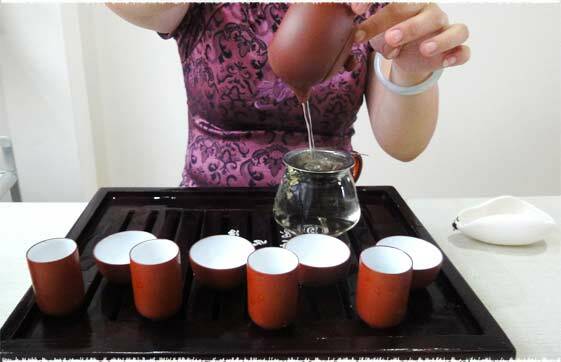 It’s no problem to brewing 5 or 6 cups when you use Chinese Gongfu Way. If you use Western method to brewing the tea few minutes, you can use the leaves once or twice. 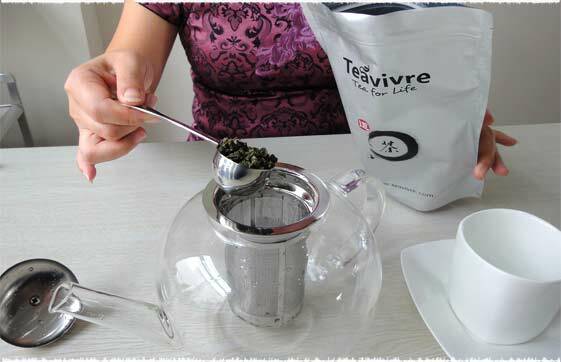 And if you just place few grams of tea leaves in the cup and drink with the cup directly. You can steep few cups. In fact，If you can give us more details about how to brewing the tea, I can give you an accurate answer. With Ti Kuan Yin I find that it is quite bitter if sipped when very hot. I always drink it when it has cooled down quite a lot, in the cup. In Australia I find that the prices vary a great deal in the shops that sell Asian food and drink products. Some shops sell Ti Kuan Yin for more than double the price of other traders. 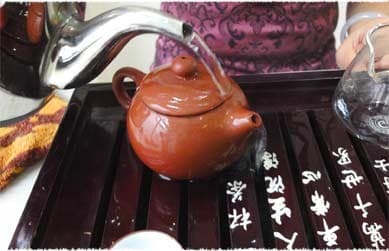 About brewing Tie Guan Yin, if you use western methods, it usually use 2 to 3 tea spoons tea, the water of 100 ºC and wait for 3 to 5 minutes. 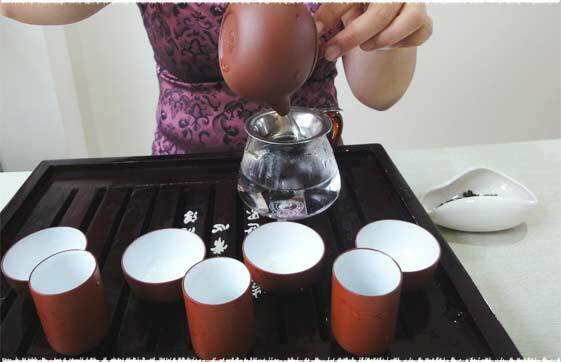 If you use Chinese Gongfu methods, it usually use 5-7 grams tea and wait for 20s-30s before we pour the liquid out. If you feel it taste bitter when drinking hot, you may try to shorten the brew time. Is this an herbal tea? I understand the caffeine content is medium . What does this mean? I cannot use too much caffeine. I can drink herbal teas. If you can’t use too much caffeine, here I suggest trying some herbal tea. Hope it’s helpful for you. Hello, could you please describe the technique for judging the water temperature as I don’t use a thermometre but go by eye to check the bubbles etc in the water heating on the stove. This would be helpful, thanks so much. The temperature is quite important for brewing tea. High temperature usually makes tea taste bitter. So if you want to enjoy a tasty tea, I suggest you can consider buying a thermometer. 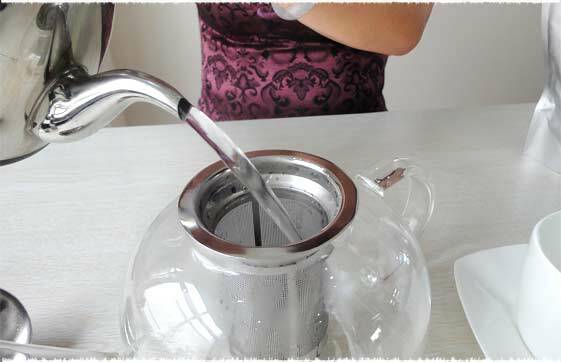 1: If there’s a lot of steam in the teapot and coming out straight, then the water temperature should be above 90 ℃. 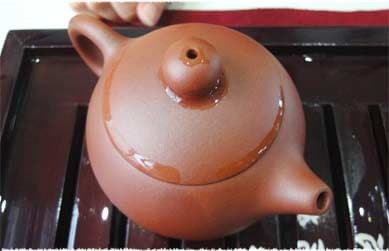 3: not so much steam in teapot but all sideways drift, the temperature should be at 80 ℃ or less. You mentioned quantity of tea for Gungfu method, but you didn’t mentioned quantity of water. I have unglazed sand-fired 300 ml tea pot. How mucjh grams of Tie Guan Yin I need for this pot? 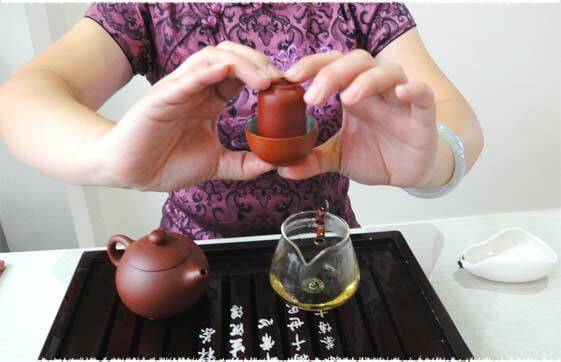 You can about 10 grams tea if you use a 300ml zisha teapot. And if you prefer a trong taste, you may add more teas. Hope this is helpful to your concern. Thank you for tie guan yin tea,it is really the best.I have tested it and still taking it, it is really the best. Hello Jalal. Thank you for interesting our teas! If you have a blog, you can join our Free Tea Tasting Activity to get free tea samples! 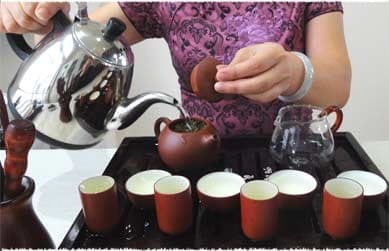 Here is the link: https://www.teavivre.com/contacts/free_tea_tasting/. If you don’t have a blog, it is ok. This activity also works with steepster, or other social websites, like facebook, tumblr, or some forums. NextNext post: How to brew Chinese Gunpowder tea?